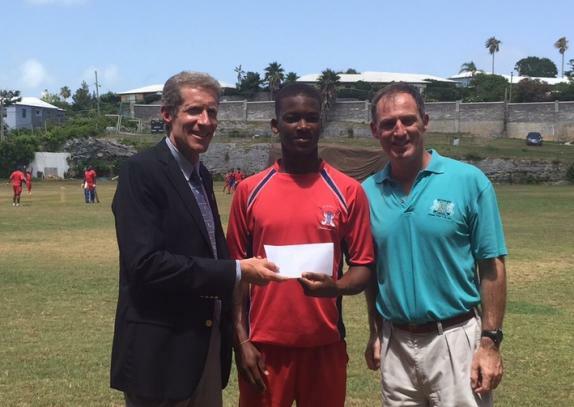 The Bermuda Cricket Board [BCB] announced that BF&M have provided financial support to assist the BCB National U19 in their efforts to qualify for the ICC U19 World Cup to be held in Bangladesh next year. The squad of 14 players and 4 stand-by players are currently attending a one week high performance camp at DRC. BCB President, Lloyd Fray said: “I am very proud of the achievements, performances and excellent sportsmanship displayed by our National U18 players. John Wight, President and CEO of BF&M said, “BF&M have enjoyed a long and rewarding partnership with the Bermuda Cricket Board. “BF&M have been the official insurer for the BCB for over 10 years, BF&M have supported women’s cricket and have been supporting the BCB youth programs for 8 years. In particular, BF&M support the U17 and U18 age groups, an age at which constructive fun activities are critical for young men. “BF&M are proud to see the development of the 18 players that have been selected for the Bermuda squad for the U19 World Cup Qualifier. We are particularly pleased to be able to provide support for the week long training camp for our national team in preparation for this tournament, hosted in Bermuda next week. These are some of the most talented youngsters in the island. Unfortunately the only way they could be ready to compete with other teams is to be overseas competing against quality teams. This horrible cricket I see on weekends couldn’t possibly prepare them for anything. And give me a break about top class training techniques. This stands for nothing in Bermuda. I know we have about two or three overseas, but that is not enough. Well done BF&M! Thank you for supporting our young people!